It’s easy to absent mindedly imagine the Internet as “the cloud” – a vast, ethereal accumulation of information held in the databanks of billions of computers; a collection of large and small networks connected by satellites and WiFi. To some it may seem almost bizarre to think that this technology, once deemed the province of science fiction, is in fact connected using cables – a global extension of the familiar tubes that clutter our offices and the bedroom floors of teenagers. 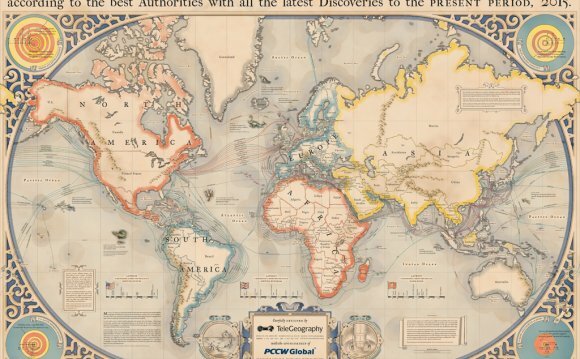 The extensive network consists of over 980, 000 km of fibre optic cables buried beneath the seabed between continents, spanning the world’s seas and oceans. The mountain of data available is housed across innumerable individual networks and a multitude of data centres across the globe (Google alone has 12 data centres across America, Europe and Asia, allowing them to process over 20 billion web pages per day). There are currently 263 active cables in place, with a further 22 planned in coming years. It is estimated that between 95% and 99% of all Internet usage is carried along these cables. The huge network, made up of cables, Internet exchange points, cable landing stations and roadside regeneration huts, carries billions of gigabytes of data every month. In this age of connectivity, even the most mundane elements of our daily lives rely on access to the Internet. In a typical British household, you will find between three and four smart phones, a laptop, a PC, and at least one touchpad. Yet it is not simply computers and mobile devices that now demand bandwidth. From everyday items, like toothbrushes, to essential medical technology, such as pacemakers, our reliance on the Internet and our need for greater and more reliable bandwidth is steadily growing. This growing network of people and Internet-enabled devices, processes, systems and services is referred to as the Internet of Things. According to Cisco’s Connections Counter, in July 2013 the Internet of Things consisted of over 10 billion things connected to the Internet. It is estimated that this will increase to around 50 billion by 2020. All of these connections combine to generate an astounding amount of global Internet traffic. As part of their Visual Networking Index, Cisco have calculated that global Internet traffic in 2013 was approximately 51 exabytes (that’s 51 billion gigabytes) per month. They forecast that this will increase to 132 exabytes by 2018. Bandwidth capability will need to increase in tandem with this rise in demand to support the developments in technology and commercial opportunity brought on by the Internet of Things. In April 2014, telecommunications research and consulting firm, TeleGeography reported that demand for international bandwidth increased by 39% to 138 terabytes per second (TBPS) in 2013 – over 4 times more than the global demand in 2009 (30 TBPS). Demand is expected to increase threefold again by 2018. Telecommunication companies and content providers alike are working on new technologies and projects to facilitate the rapidly increasing traffic and the demand for improved broadband. Giants such as Google and Microsoft are now focusing on connecting data centres to one another, rather than connecting end users to data centres. Projects are already underway to improve the capacity of the cables themselves; the new SeaMeWe 5 100G cable system will provide 24Tbs per second, considerably more than the existing cable system. To ensure the impact of any future breakages and faults is minimised, operators are developing contingency plans which incorporate alternative connections between continents, such as secondary lines and satellite uplinks, to enable a faster reroute of traffic. Operators are also considering alternative locations for cable systems via South America and the Arctic, and encouraging the creation of terrestrial systems where possible – especially in bottlenecked waters like the Suez Canal. Addressing concerns of sabotage and data terrorism, security companies and software developers have created both physical and cyber security systems at various points in the infrastructure to protect it from abuse, from firewall systems for data centres to cloud-based Internet intelligence and intrusion prevention systems for networks. While the number of connectable devices outweighs the amount of people in the world, less than 40% of the global population has access to the Internet. In addition to improving and protecting the current infrastructure, projects focused on bringing Internet connectivity to those in rural and remote areas of the world are rapidly developing. While the number of connectable devices outweighs the amount of people in the world, less than 40% of the global population has access to the Internet.